We carry a variety of different exhaust system and accessories from popular brands such as Flowmaster, Magnaflow, and MBRP. The classic sound of a Flowmaster chambered exhaust, our American Thunder® Series features mufflers tuned to deliver more power, torque, throttle response and mileage. 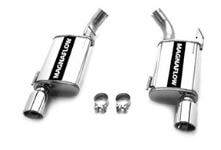 Best of all, these exhaust systems take sedate vehicles and deliver that great performance tone especially designed for muscle car and truck fans. American Thunder is the most authentic Flowmaster muffler sound we offer. The Force ll Exhaust System is perfect for customers looking for some level of performance tone enhancement, but are concerned about installing an exhaust system that is too aggressive for daily street driving. The Force II exhaust systems commonly incorporate larger displacement mufflers and resonators to control overall sound, but increase the “performance impression” made by the vehicle. Our Force ll exhaust systems are a nice way to step up performance and tone on any vehicle. Looking for something that sets you apart from the pack? Our American Thunder® Pro Series exhaust systems deliver that same great aggressive exhaust note you love with the American Thunder chamber exhaust system, but with a deeper, uniquely special tone due to the use of our laminar flow muffler technology. Available for a wide variety of applications including late model Mustang, Camaro and diesel vehicles. Our Outlaw® Series Exhaust Systems/Kits feature race-bred components that ensure minimal restriction and only slight reduction on sound over open exhaust tubing on non-catalytic converter-equipped vehicles. With new vehicles featuring catalytic converters, Outlaw Systems can be compatible with regular street driving. If you desire the ultimate in aggressive sounding performance, an Outlaw Series exhaust system could be right for you. Our newest laminar flow technology muffler, the dBX® delivers the same fine attributes as the American Thunder® Pro Series mufflers with a deep tone and great overall acceleration sound, but in a compact case perfect for smaller vehicles. The dBX features 304 stainless steel casings so they can be polished to a brilliant luster that is attractive to sport compact fans. If you want a truly track-tested, dyno-proven exhaust system that delivers a uniquely different tone, our dBX exhaust systems are the perfect fit. Exhaust system built to fit behind the factory catalytic converters. These systems are 100% emissions compliant and designed to optimize exhaust flow using mandrel bent tubing and straight through mufflers. Exhaust systems are designed for those seeking increased performance and better economy, balanced with interior and exterior noise levels. These systems are tested against SAE J1169 standards. 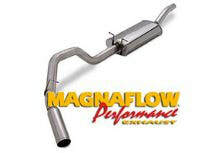 MagnaFlow’s Polished Stainless Steel Tips will last 5 times longer than chrome tips. These Super-Tough Tips will continue to shine for years to come with a LIFETIME WARRANTY against defects. MagnaFlow Tips are 100% Stainless Steel, built to last with Weather-Proof. Exhaust systems are designed for those seeking maximum performance, reduced mass and an aggressive exhaust note that demands attention. These systems may not comply with all local or federal noise requirements. Magnaflow has expanded their line of 49-State & Canada Direct-Fit Converters. Check out our selection of Universal & Direct-Fit Catalytic Converters. The Street Series is designed for the souped up street machine. It features a high flow tuning tube, balanced to the needs of the high revving import engine. The Street Series emits a smooth, deep tone while offering improved performance over OEM equipment. The Street Series is recommended for street cars with bolt-on performance modifications and custom body kits. MBRP’s Pro Series is the best performance exhaust system that money can buy. It is a series designed and built for the serious enthusiast who will settle for nothing less. Constructed from T304 stainless steel it delivers you optimal durability that keeps on looking its best. Easy to clean and maintain this is the product of choice for owners of lifted vehicles, show trucks or who operate in severe environments. We back it with a Lifetime Warranty. Performance is one thing but at MBRP we believe that appearance and sound is just as important. 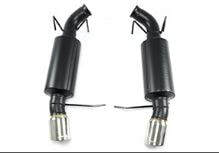 Every MBRP performance exhaust system has been specifically tuned to get the optimal sound from your pickup. With our MBRP brand etched on the tip and our unmistakable styling, there’s no question that you have the hottest exhaust on the road – MBRP. Built from heavy duty aluminized steel our Black Series performance exhaust systems offer a true “murdered out” style without compromising on quality and performance. With fully sealed seams to resist rust you can count on this system to really hold up. The black coat finish is specifically formulated to withstand the extreme heat and abrasive conditions an exhaust system is exposed to. MBRP’s XP Series is the performance exhaust of choice for the enthusiast who needs a system that can take anything that the road throws at it. This system’s rugged sixteen gauge T409 construction can be counted on to withstand everything from salt to rocks, tar to grime. We have had such success with this line that we back it with a Lifetime Warranty. With MBRP Competition pipes you will never have to worry about your exhaust system being the weak link in winning that checkered flag. Mandrel bent tubing, the lowest bend degree angles and extensive dyno tuning guarantee you maximum exhaust flow, maximum horsepower, maximum torque and minimum exhaust gas temperatures. You won’t believe the power and throttle response you’ll unleash from your truck just by bolting on MBRP Competition pipes. F.A.Q about Bungs – Bungs are the ports in which you would reinstall your factory sensors. A system with the bungs is suggested if you are running a performance chip/tuner that has gauges so you will be able to read temps from your factory sensors. This will prevent you from having to install a pyrometer (egt sensor) into your exhaust manifold. This is a “Race Only” product section used solely for competition. Its use is limited to closed-course racing that is formally sanctioned by a recognized racing organization. Any other use, including recreational off-road use, could be in violation of local, state and federal laws. DPF is an acronym for Diesel Particulate Filter. A DPF works in conjunction with the oxidation catalyst and EGR valve to remove a majority of the NOx, particulate matter (think black, cough-inducing soot) and unburned hydrocarbons from burned diesel fuel. Soot is a natural byproduct from the combustion of diesel fuel. Inside the DPF is a porous honeycomb structure that catches the soot as it passes through. After the soot builds up over time, the onboard computer controls fuel injection to allow unburned fuel to enter the filter at measured intervals where it flares off and generates increased temperatures that incinerate the accumulated soot. The result: Soot is chopped by over 90-percent. Step 2: ELECTRONICS – You must select an electronic performance unit for the exhaust to work properly with your vehicle. Warning: You MUST use DPF delete capable electronics when removing the DPF off of the vehicle. In addition, running DPF delete tunes without removing the DPF will result in engine codes and filter blockage.